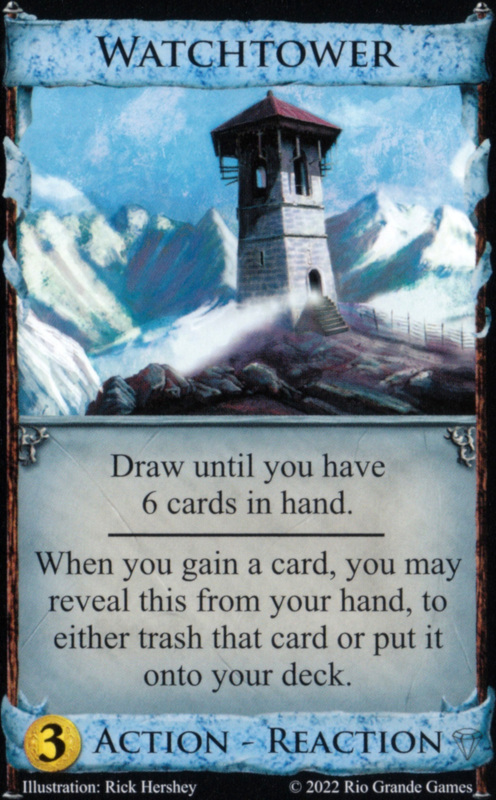 A good Dominion player doesn’t only know which cards are strong individually, but also what combinations of cards are absolutely game breaking. If you play Dominion Prosperity, you need to know at least these four very powerful combo’s. Goons is a very powerful card on its own; it attacks your opponents, grants you a buy and 2 purchasing power, as well as a victory point for every card you buy this turn. These victory points can really ramp up if you manage to buy a lot of cards in one turn while playing one or several goons. The obvious limiting factor for buying a lot of cards in a single turn is that you usually cannot afford to buy many good cards, as good cards are expensive. Watchtower solves this problem, because it allows you to but cheap, bad cards, and then immediately thrash them with Watchtower’s passive effect. This interaction can get pretty ridiculous if combines with other cards that grant extra buys, such as worker’s village. For example, if you manage to play three goons and three worker’s villages, you can buy and thrash 7 curses, gaining you 21 victory points in one turn without gaining a single useless card in your deck. A great early game combo is Vault with Grand market. The early game is all about scaling to high quality cards as quickly as possible. 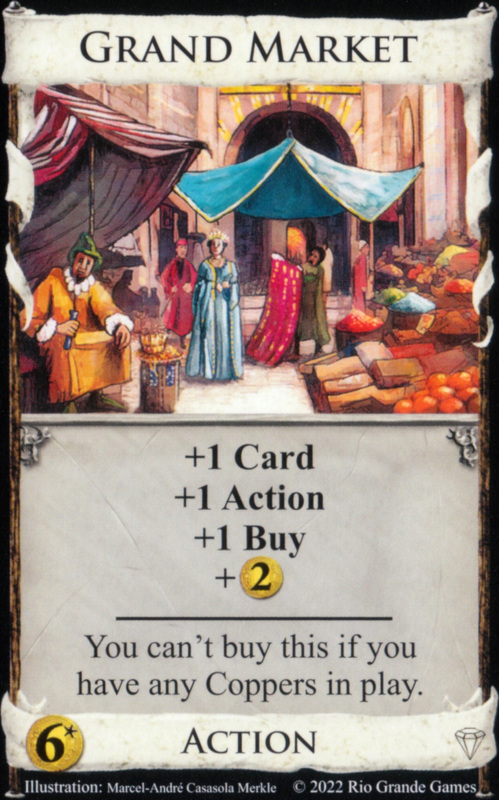 Grand market is a great card, but is usually quite hard to obtain due to the constraint that it cannot be bought when you have Coppers in play. This is easier when Vault is in the game. 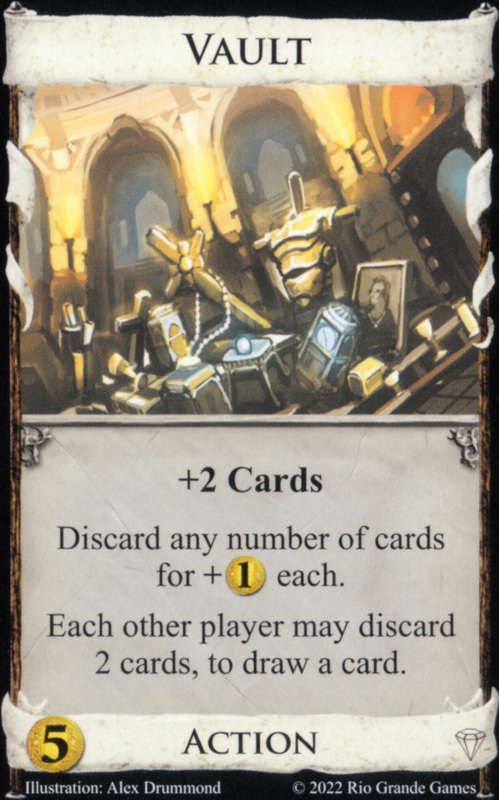 If you play a Vault, you draw up to six cards, which you can then all discard to obtain six purchasing power with no Coppers in play. Thus, buying a Vault the first time you have five purchasing power, usually shortens the time you need to buy your first Grand Market significantly. Using an Expand on a Peddler feels like committing white collar crime. The idea is simple: you play a bunch of action cards in a turn and buy your peddlers for cheap. Then you draw expand and Peddler in one turn and Expand your Peddler to a Colony. You effectively bought a Colony for a fraction of the price. This combination works particularly well because Peddler reinforces itself. 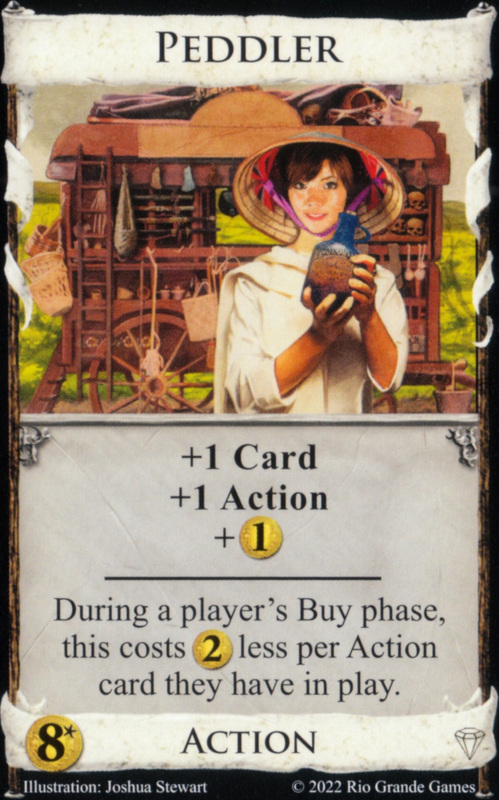 Buying a Peddler gives you an extra action card in your deck that you can easily play to make Peddlers cheaper to buy in coming turns. Stacking your deck full of Peddlers is relatively easy because of this. 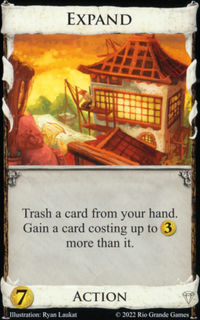 Talisman individually is a mediocre card at best. It allows you to double up on cards you purchase for four or less, but those cards are usually not the kind you want a lot of in your deck. Combining Talisman with Quarry however, leads to powerful turns. 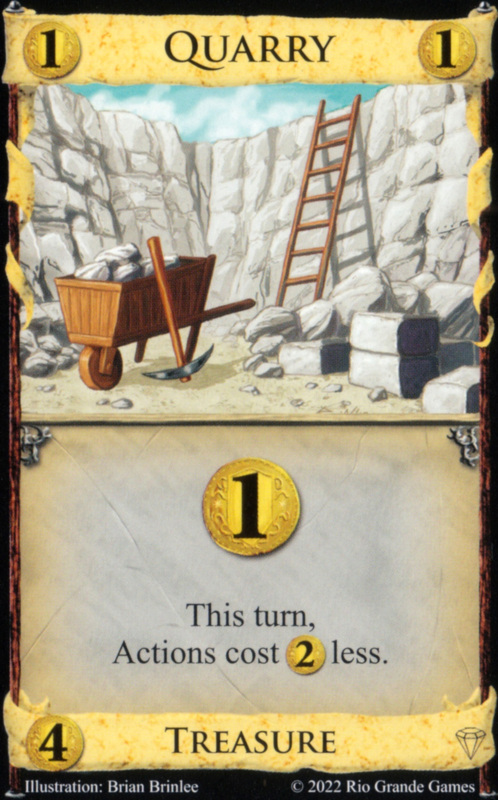 Quarry reduces the cost of action cards by two, thus if you play a Quarry, cards like Goons and Grand Market suddenly have a cost of four, which means that they are in range of the Talisman effect. If you manage to play a Talisman and a Quarry in the same turn, you can thus get two six-cost cards for four purchasing power. That is a discount of eight. That’s a completely broken combo. If you don’t own this game yet we recommend that you buy Dominion Prosperity on Amazon through our affiliate link (we earn a commission at no further cost to you). The Prosperity expansion introduces some game changing cards such Platinum and Colonies. If you are not convinced yet, you can read more of what we say about Dominion Prosperity.